Do you have polished travertine? Whatever your need is Orlando Travertine Restoration has the training and experience to polish your travertine. Using finer abrasives, or compounds we achieve a very clean, highly reflective, shiny finish. The shine intensity can range from a honed (more of a matte finish) to a ”custom medium shine” to a very mirror like “high gloss finish.“ The amount of fill (see fill effect photo below), open pores, blade marks will affect the shine uniformity especially when going with shinier finishes. Travertine looks its best when finished to a high gloss. The center tile has quite a bit of fill in the Travertine. Filler is usually epoxy or grout inserted in large pits/pores and will not reflect the light the same way the stone will. The shinier the finish on the stone, the more contrast the fill will create. The dark band is a shadow from the windowpane.You can see the sky mirrored in the stone. Travertine polishing has many different technical terminologies. Because of the confusing terminology in the industry many homeowners are deceived by the less scrupulous companies for a shiny travertine finish that has some very expensive consequences down the road. Diamond polishing with diamond abrasives is the preferred method where you are seeking to achieve a highly polished surface, one with a good deal of clarity and during our stone restoration services. 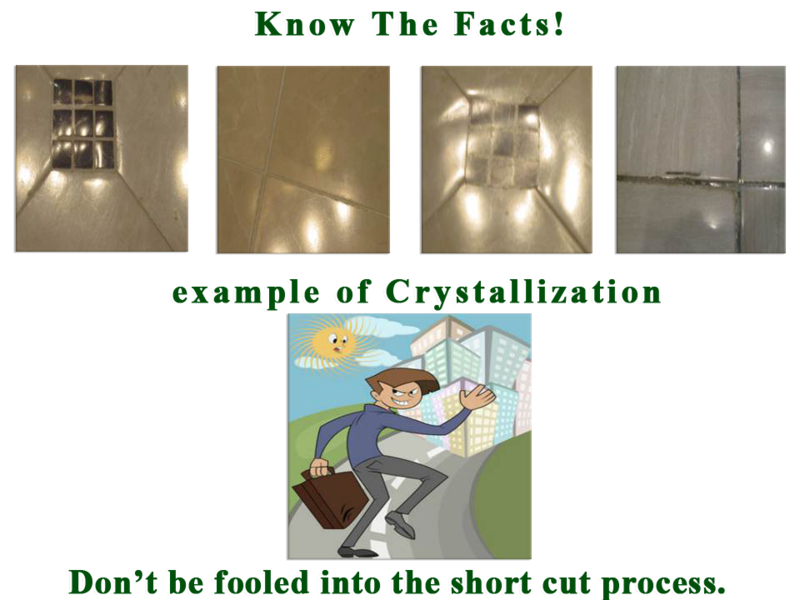 We are often asked, “Why do they do crystallization?” The answer: It’s cheap and quick. Are you ready to have your travertine cleaned and polished to a mirror shine?